Common buckthorn in Scout Field, Aug. 28, 2014. Common or European buckthorn (Rhamnus cathartica) may be the most obvious non-native plant at the “Federal Farm” area. It’s the majority tree to be seen as one turns into the parking lot from Old Seneca Turnpike, and it fills both sides of the trail as one walks in past the kiosk (not a great welcome to a “conservation” area). It can be found just about anywhere on the Federal Farm, in each of the town’s conservation areas, and of course throughout the town as a whole. Buckthorn has big advantages over the native small trees and shrubs like hawthorn, dogwood, and cherry, that it replaces. For one, its leaves stay green about two months longer than native trees, providing it a much longer growing season. Buckthorns are fast growing, especially in full sun, and at about five years of age, they start producing a profusion of fruit (drupes) that each contains about fours seeds. 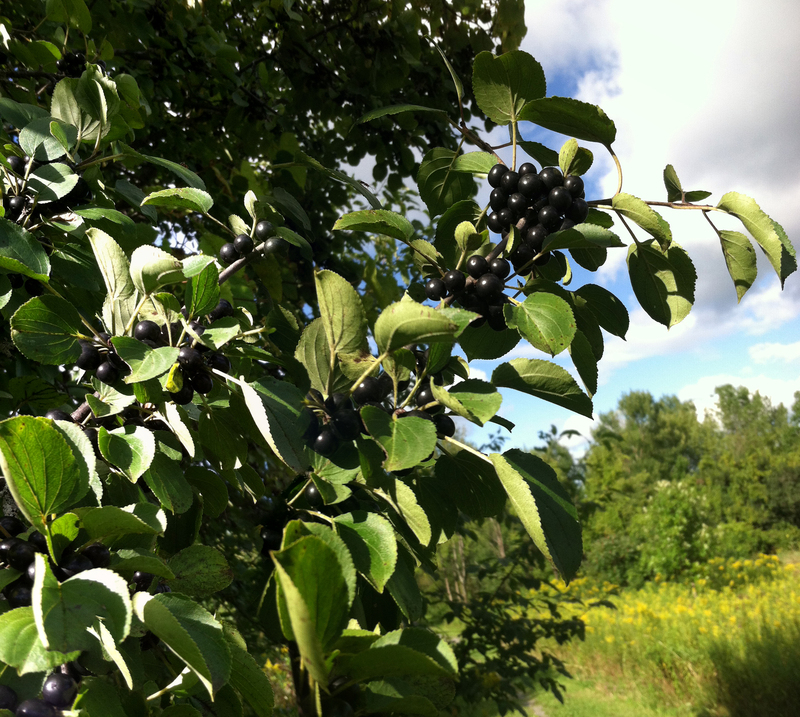 Although buckthorn drupes provide little nutrition, and most native birds avoid them, they will eat them when native fruit is not available. The birds of course spread the seed, and passing through their digestive tracts has been shown to improve germination rates. Seeds that don’t germinate remain viable in the soil for several years. 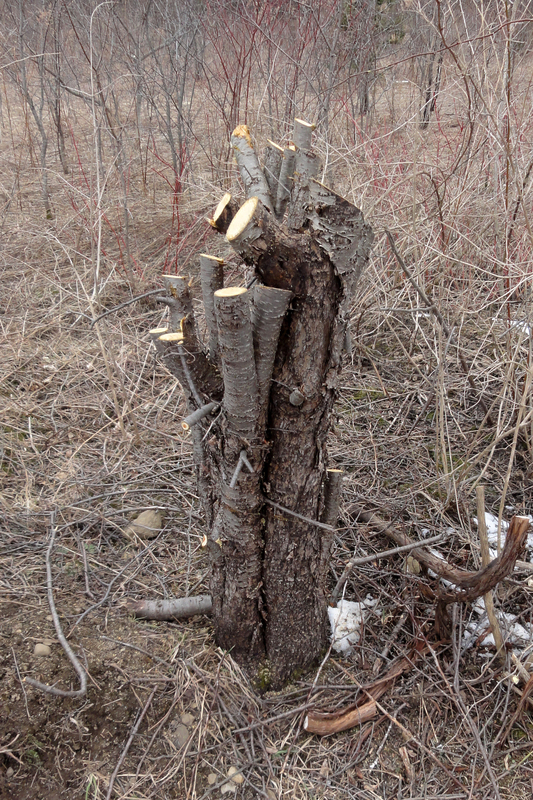 Buckthorns also reproduce vegetatively via root sprouts, especially after being cut down, making them difficult to eradicate. Many years of recutting, mowing, or burning are required to stop the resprouting from root masses. Buckthorns produce very dense shade that prevents most native plants from growing, and may also be allelopathic to some extent. Like most exotic plants there are no natural controls like insects or herbivores to keep it in check. Samuel W. Gale (2000) “Control of the Invasive Exotic Rhamnus cathartica in Temperate North American Forests.” Restoration and Reclamation Review. Department of Horticulture Science, University of Minnesota, St. Paul, MN.